In the time it takes to circle the bases, Ted Simmons experienced the high of hitting an improbable home run and the low of being ejected. The incident symbolized the frustrations of the 1978 Cardinals. 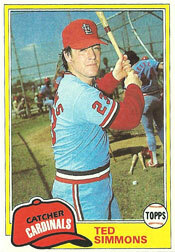 Though Rapp eventually apologized for his words, he lost the respect of many Cardinals players, who knew Simmons as a leader who played to win. Under Ken Boyer, who replaced Rapp, the Cardinals got within two games of .500 at 14-16 before they nosedived, losing 13 of 14 and falling to 15-29. In the ninth, the Cubs turned to closer Bruce Sutter to preserve a 2-1 lead. First to face him was Simmons. The Cubs scored in the 11th and won, 3-2, sending St. Louis to its 14th loss in 15 games and extending Chicago’s win streak to seven. The Cardinals filed a protest with the National League, arguing Simmons shouldn’t have been ejected. “I think this has been happening, or brewing, over a long period of time, but unless you call an umpire a name, he (Simmons) shouldn’t be kicked out,” Boyer said. “We think very strongly that umpires ought to be fined, suspended or reprimanded, just like players. Three decades later, in an interview with the San Diego Union-Tribune, Rick Hummel of the St. Louis Post-Dispatch said the ejection of Simmons remained memorable.